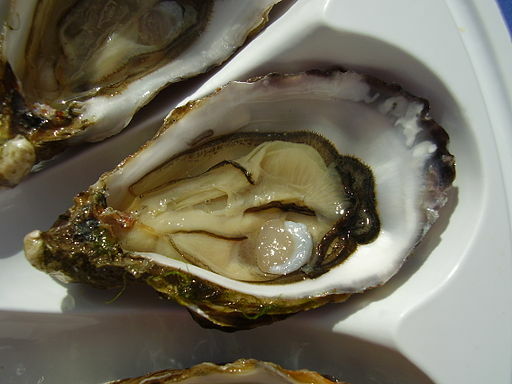 Okadaic Acid: Diarrheal Shellfish Poisoning . . . oh my! An algal bloom forces the precautionary shutdown of oystering in Galveston Bay (Texas), as reported by Galveston County’s Daily News. Since oyster season is only six months long, and ends April 30th, this closure is sure to have an economic impact in the area. But it’s just an algal bloom, what’s the big deal? Well, in this case, if you’d like to avoid poisoning people, it’s best to pay attention to these things. There are several types of shellfish poisonings that Mother Nature has bestowed upon us: paralytic, neurotoxic, amnesic, and diarrheal. All of these types of shellfish poisonings are caused by different algal blooms, and the toxins they produce. The bloom in Galveston bay causes diarrhetic shellfish poisoning. Of the four, this is the one I’d rather have, because even as bad as it sounds, it is the safest. Diarrhetic shellfish poisoning (DSP) is exactly what it sounds like: diarrhea. Diarrhea, cramps, naseau, and vomitting, are all possible symptoms. Either way, somethings coming out of you or making you wish it would. The little microscopic dinoflaggelates responsible for this are from the genus Prorocentrales, and they produce the toxin responsible for DSP: Okadaic acid. Prorocentrales is taken up by filter-feeders such as mussels, scallops, and oysters. These bivalves simply open their shells and filter water through their gills, concentrating Prorocentrales and okadaic acid. Once there, it’s there to stay. Okadaic acid is stable, and not readily destroyed by cooking, and can survive storage conditions. So it is for this reason that the State of Texas closed Galveston Bay for oystering. First reported in the Netherlands in 1961 (1), DSP soon became worldwide with outbreaks in Japan in the 1970s. But it was not until 1982 that okadaic acid was determined to be the cause (2). Okadaic acid had previously been found in two different species of sponge commonly found along the Pacific coast of Japan (3). One of these species is Halichondria okadai, from which okadaic acid is named. The symptoms of diarrhea and vomitting start within 3 to 12 hours after ingestion of tainted shellfish, with a frequency of up to 12 times per day. Thankfully symptoms only last about 3 days, but that’s still up to 36 trips to the toilet. Oh my! And the amount of okadaic acid needed to bring about this toilet marathon? A measly 48 micrograms (4). That’s 0.048 milligrams, or 0.000048 grams. You can’t see it with your naked eye. The mechanism is thought to involve the inhibition of serine and threonine protein phosphatases. Phosphorylation of proteins that control intestinal cell’s sodium secretion would impair the system’s water balance, leading to diarrhea (5). The good news is that no one has ever died from it, though I’m sure at the time some wish they had. So when someone’s on the John for three days and claims they “ate a bad oyster,” remember this little tale of okadaic acid and DSP. 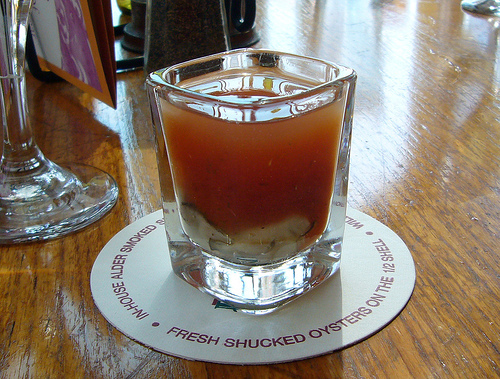 And here’s a toast of an oyster shooter for a quick return to oyster season. 1. Kat, M. “Diarrhetic mussel poisoning in the Netherlands related to the dinoflagellate Dinophysis acuminata.” Antonie van Leeuwenhoek 49 (1983): 417-427. 2. Murakami, Yasutaka, Yasukatsu Oshima, and Takeshi Yasumoto. “Identification of Okadaic Acid as a Toxic Component of a Marine Dinoflagellate Prorocentrum Lima.” Nippon Suisan Gakkaishi 48.1 (1982): 69-72. 3. Tachibana, Kazuo, Paul J. Scheuer, Yasumasa Tsukitani, Hiroyuki Kikuchi, Donna Van Engen, Jon Clardy, Yalamanchili Gopichand, and Francis J. Schmitz. “Okadaic Acid, a Cytotoxic Polyether from Two Marine Sponges of the Genus Halichondria.” Journal of the American Chemical Society 103.9 (1981): 2469-471. 4. Dominguez, Humberto J., Beatriz Paz, Antonio H. Daranas, Manuel Norte, José M. Franco, and José J. Fernández. “Dinoflagellate Polyether within the Yessotoxin, Pectenotoxin and Okadaic Acid Toxin Groups: Characterization, Analysis and Human Health Implications.” Toxicon 56.2 (2010): 191-217. 5. Cohen, Philip, Charles F.b. Holmes, and Yasumasa Tsukitani. “Okadaic Acid: A New Probe for the Study of Cellular Regulation.” Trends in Biochemical Sciences 15.3 (1990): 98-102. Tags: DSF, okadaic acid, shellfish. Bookmark the permalink.